Mozi always has a great range of prints which make themselves onto homewares, accessories and decorations. This year's partridge/dove and tree motif could potentially make its way into your everyday; from a distance the pattern looks almost baroque. Polli has some lovely decorations for tree or table using their signature laser-cutting technique. These perspex tree ornaments are fantastic and feature Polli bird cut-outs. And don't forget some festive earrings for holiday entertaining. Kylie Johnson from paper boat press has produced fabulous ceramic ornaments this year which I showcased this week. 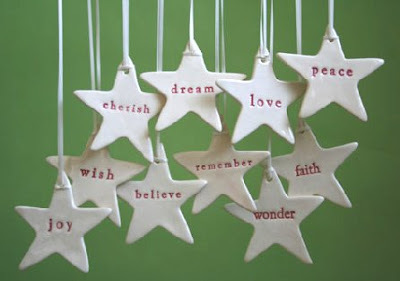 I also love these hanging stars with wishes and hopes for the new year.